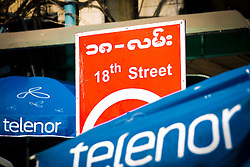 18th Street, Yangon, Myanmar is in the heart of Chinatown full of market stalls. The east-west grid of central was laid out by British military engineers Fraser and Montgomerie after the Second Anglo-Burmese War. The city was later developed by the Public Works Department and Bengal Corps of Engineers. The pattern of south to north roads is as follows: one broad 100-foot (30 m) wide broad road, two narrow streets, one mid-size street, two more narrow streets, and then another 100-foot (30 m) wide broad road. This order is repeated from west to east. The narrow streets are numbered; the medium and broad roads are named. 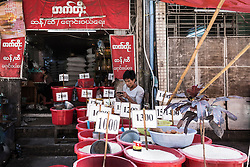 For example, the 100-foot (30 m) Lanmadaw Road is followed by 30-foot (9.1 m)-wide 17th and 18th streets then the medium 50-foot (15 m) Sint-Oh-Dan Road, the 30-foot 19th and 20th streets, followed by another 100-foot (30 m) wide Latha Road, followed again by the two numbered small roads 21st and 22nd streets, and so on. The roads running parallel west to east were the Strand Road, Merchant Road, Maha Bandula (originally Dalhousie) Road, Anawrahta (Fraser) Road, and Bogyoke Aung San (Montgomerie) Road.